Your backyard oasis is an expression of your lifestyle. 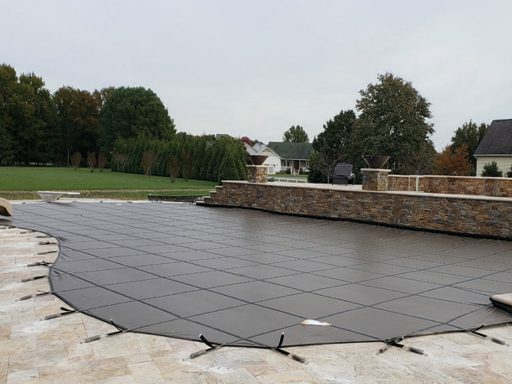 Meyco’s in-house design engineers can tailor a cover for even your most unique poolscapes. 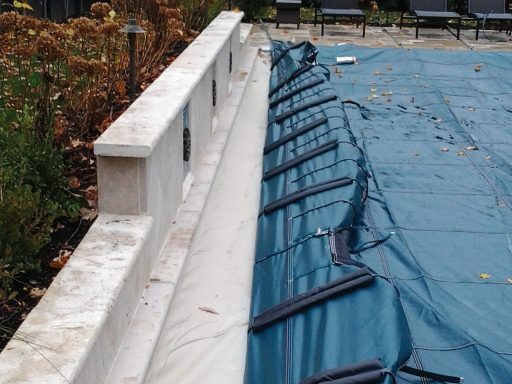 Raised walls, elevated spas, vanishing edges, secret grottos, in-pool fountains – even multi-level swimming pools are protected with Meyco covers. Plus, our patented Polyguard custom fit means no gapping, no messy ropes or pillows, no wrinkles and no unsightly water bags. 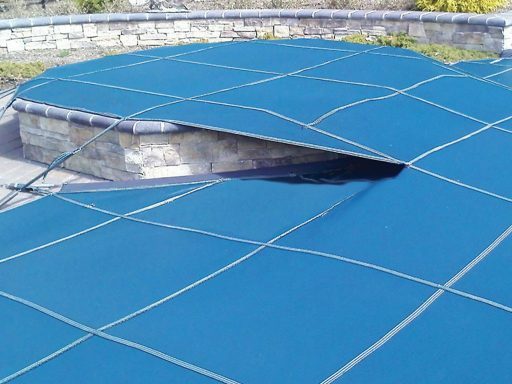 As the innovators of the original safety pool cover, Meyco’s customized one-of-a-kind covers go beyond the basics with custom features designed to keep your pool secure and attractive between swim seasons. 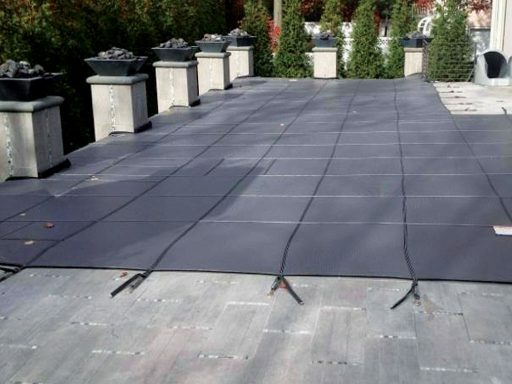 Meyco’s history of innovation has yielded great advancements in the evolution of the safety pool cover. 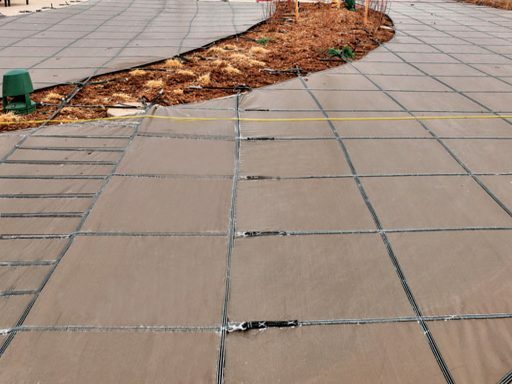 From the invention of the world’s first Pop-up Anchor to the exclusive Bridging Application used to create covers of any size, Meyco leads the way. 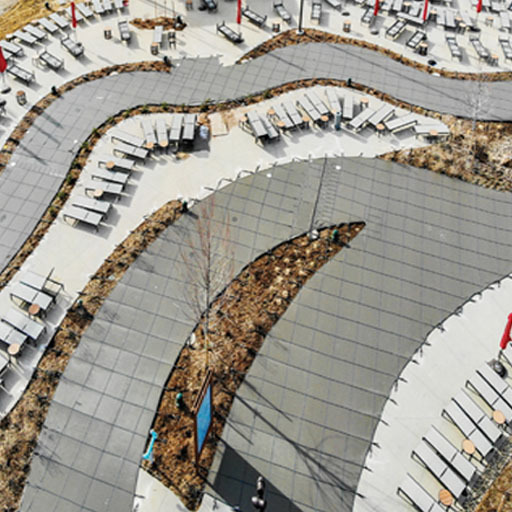 Meyco’s exclusive – and most secure – bridging application lets larger covers separate into smaller, more manageable covers for seasonal installations and openings. Ideal for large commercial pools and water parks. Protect your pool between swim seasons and promote your company colors at the same time. 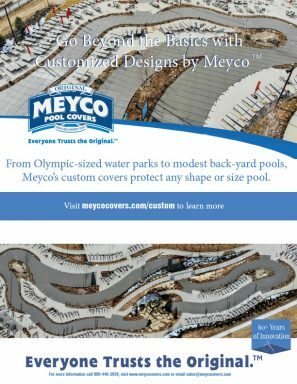 Meyco’s logo’d covers are the ultimate branding opportunity for corporate and commercial pools. a 1” foam barrier between the surface and cover, providing extra protection for both. Great for tiled walls or extra rough coping. 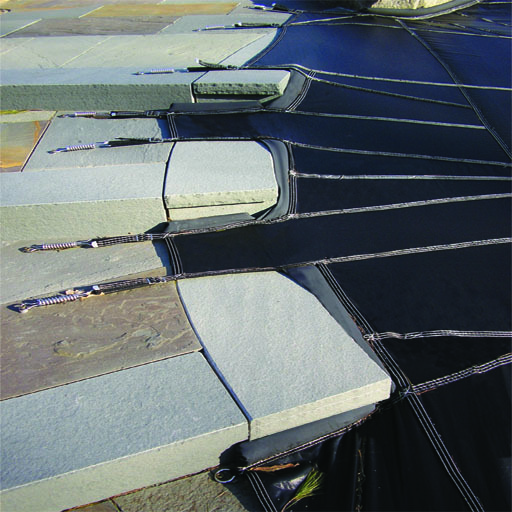 Setback Straps – Setback straps provide additional tension and stability in areas where there is limited decking available. Meyco’s industry renowned Step-Cut application is the classiest way to go up and over a raised area with no pillows, plastic or pads. 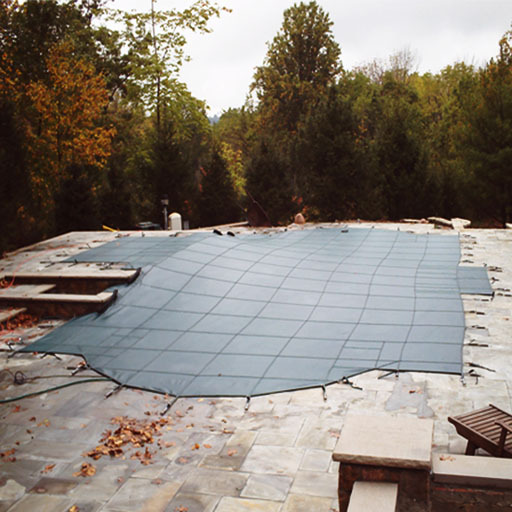 Integrated directly into the main pool cover, the Superflap spa cover offers easy use of a connected spa during the cooler months with a one-piece install for the entire poolscape that eliminates undesired gapping without impacting the main cover’s tension and security. 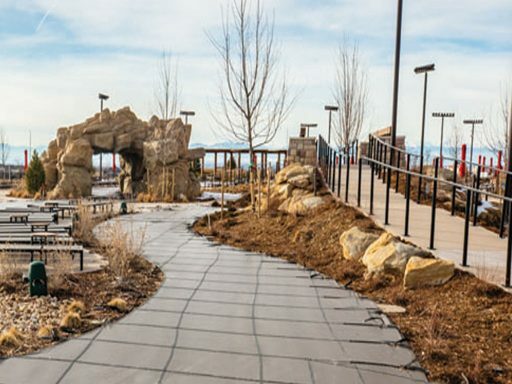 Meyco’s Vanishing Edge cover is designed to fit snugly over any negative edge and attach securely into the hardscape without messy ropes, waterbags or unsightly plastic flaps. 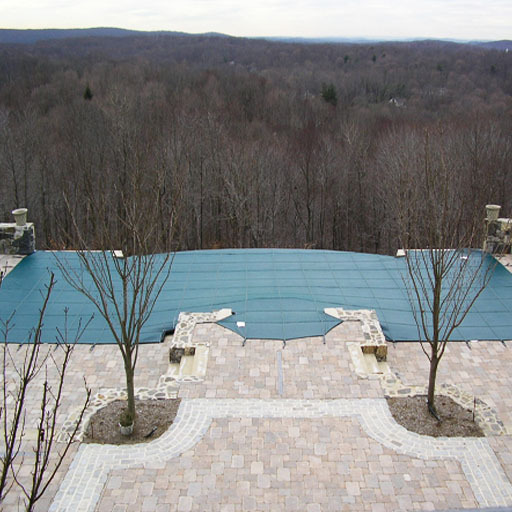 Raised walls, waterfalls, secret grottos and more deserve the same protection as the rest of your swimming pool. 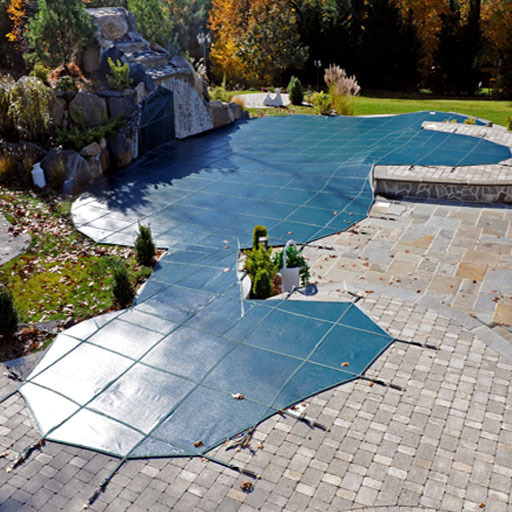 Meyco’s custom covers are designed to fit snug around vertical poolscape features with special anchors and pivoting O-rings/snap hooks that allow the cover to attach securely around rock walls, slides and water features.